Winter is here – it’s cold and miserable outside – and the last thing your group members want to be doing is propaganda gardening in this weather, but you don’t want to stop meeting up and risk losing momentum. Well, the solution Incredible Edible Wakefield came up with was to have a go at making signs for their propaganda gardens. The group already ran regular Edible Gardening Club sessions but, as with most groups, it got to the point each year that meeting up in the cold and damp wasn’t much fun and anyway there wasn’t much that could be done with the group’s outdoor growing space once over wintering crops like kale, leeks, onions, broad beans and peas had been planted out and the beds were tidied for the winter. But everyone enjoyed their regular meet ups and for many it would be a miserable few weeks until spring without doing something Incredible together! While looking through the Toolshed section on the Incredible Edible Network website a group member came across the What makes a good sign? 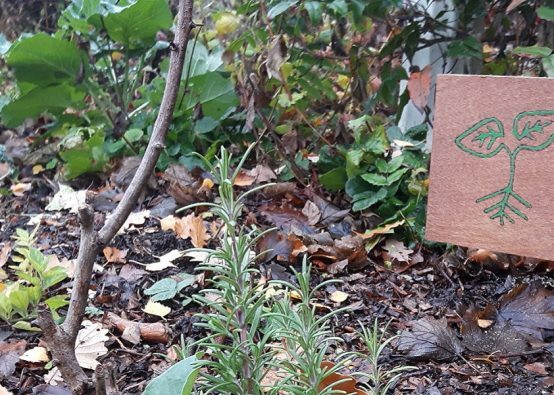 section in the Toolshed and noticed a download Signage ideas and inspiration (sign up/login required for both links) which contained examples of signs used by Incredible Edible groups across the country – many of them home made. Incredible Edible Wakefield had never been the best at labelling and signposting their growing sites but many of the examples in the download, as well as looking great, seemed easily doable with some simple tools and a few bits and pieces of scavengable material. The group worked closely with a number of community centres, maintaining growing spaces around their grounds, so getting free/cheap use of indoor space to run sign making sessions wasn’t a problem. A ‘Pyrography’ wood burning tool turned out to be a great buy for about £20 and at the first session the group made a couple of signs with the sprout symbol and group name from some donated pieces of external quality plywood and a small tin of green acrylic paint to colour in the sprout. Advertising the sessions on Facebook brought in a few new volunteers – people not keen on gardening but with a range of woodworking and crafting skills they couldn’t wait to share with the group! One or two of these volunteers knew where to get cheap/free wood and even had woodworking equipment at home and so started to take materials the group had acquired home to cut and prepare wooden templates the group could then write/decorate and varnish at their next session. 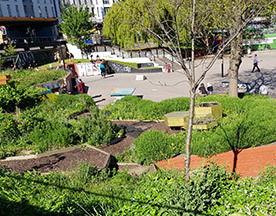 So far the group has made group name signs for themselves and four or five other local Incredible Edible groups, vertical plant name signs that can be used to identify what’s growing in their propaganda beds and plot numbers for the group’s mini allotments. They’ve also discovered blackboard paint – who knew there was such a thing, bought two more pyrography tools, so more people could have a go, and a number of items of basic woodworking tools to widen the potential for what the group could make. In fact there has been so much interest that a spin off Incredible Men/Women in Sheds group has started and is working on fitting out an old potting shed at one of the community centres as a wood working workshop to make signage, planters and other items of use to Incredible Edible Wakefield and the local community, things such as bird boxes, hedgehog houses as well as other saleable items to bring in funds to cover the group’s running costs. They say necessity is the mother of invention and certainly for Incredible Edible Wakefield the need for something to keep the group active over the winter months has turned into another Incredible initiative! 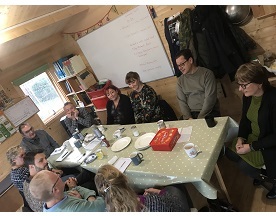 There’s lots of information, ideas and resources in our Toolshed, so sign up if you haven’t already and have a good rummage to find something useful for your group.